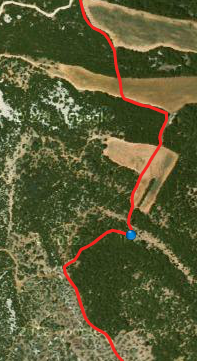 MC and I had another long trek planned for Saturday. Originally, all three of us were going to go – the LSH on Flurry, me on Aero and MC on Quieto – but when we thought about it, we realised it mightn’t be the best thing for Aero. I haven’t been able to work him as prescribed by the Osteopath due to three days of torrential rain this week (it was just like home!) and a three hour (or more) trek would have been unfair on him. The LSH was more than happy to go off to Apt market and play with his camera, while I went up to the farm early and first of all rode Aero and then started scraping the muck off Flurry. About an hour later, I wiped the dust off my face and decided that Flurry would have to do – he was superficially clean, but there was still a lot of dried mud in his feathers and his mane. MC was ready and waiting patiently, but in fairness, she started off with a much cleaner horse! The plan was to do a large loop on the north side of the ridge, which would bring us close to Reillanne, and then return along the crest of the ridge. I know part of the route, having walked it with the dogs several times, and I was looking forward to a very enjoyable ride with plenty of spectacular views. Unfortunately, about twenty minutes into the ride, MC stopped and apologised – she’s about to go for a hip operation and was in a lot of pain, despite having tanked up on pain-killers before leaving home. 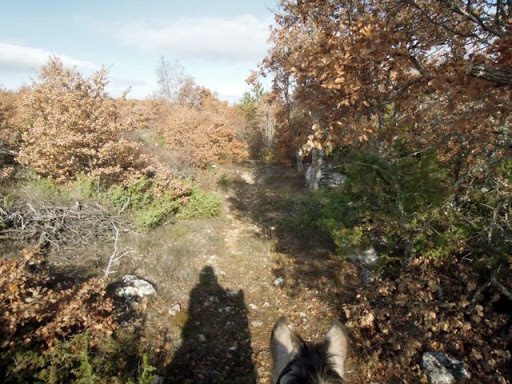 We decided to cut the ride short by just riding along the crest to Reillanne and then we would split up – she would go home and I would return to the farm via the woods. 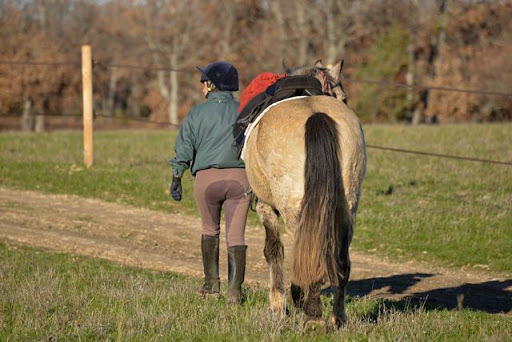 Flurry was incredibly lazy and slow – not at all like a horse that hadn’t been ridden all week! He was bootless behind and was finding the stony track tough going, so I was happy enough to do a shorter ride than planned, as I was a little bit worried about his feet. I am just going to have to put the Renegades back on him for a while and hope they don’t come apart again. We stopped for our picnic at the Reillanne end of the ridge. The sky was clear, there was no wind and the sun was shining enough to make it feel warmer than 7C. Both horses settled immediately and were happy to snack on the grass, although they both tried to snack on my baguette, too. I like this whole picnic idea! Other than when Anne and I were doing Le Big Trek, it’s not something I’ve done before, but it’s so easy to organise – throw a bottle of water, a piece of fruit and a sandwich into the saddlebags – and it sure is pleasant. Food break over, we remounted and continued. 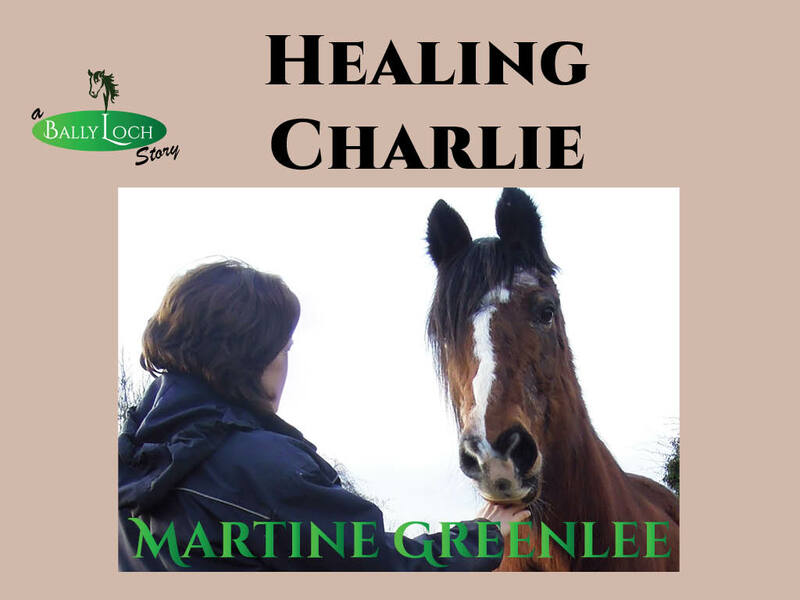 Before long, we were saying goodbye in Reillanne and tentatively making plans for Sunday – MC is one of those people who needs horses like the rest of humanity needs air and she really wants to get one more ride in before she goes into hospital. Flurry was slightly anxious and rushing when we parted company, but within minutes we had the challenge of a very large, very angry dog behind a fence. The dog was less of an issue than its shouting, screaming owner, but after a couple of hurried trot steps, I could actually feel Flurry “get a grip on himself” and relax again – you’d really wonder what goes through their heads, sometimes. We soon left the noisy dog and owner behind and made our way into the woods. I let Flurry choose the way home – there were two possible routes, and he chose the shorter one, which we’ve only done once before, in the other direction. 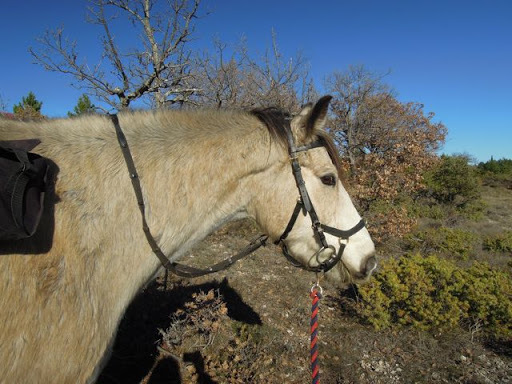 He confidently made his way along the track through the cork oak until we got to a point where the track was clearly going in the wrong direction. He paused and thought for a moment, and then headed off to the left, meandering through the trees. “You’re wrong” I told him, and thought about correcting him, then I thought, what the heck, we’re going in roughly the right direction and we can always retrace our steps. I shouldn’t have doubted him, even for a moment. After a couple of minutes, we came out into a lavender field, where I could still see traces of the tracks MC and I had left last week. After that, I just left the reins hanging for the rest of the ride! He stopped and had a nibble on some grass a couple of times, but continued amiably when I asked him and unerringly made his way home, stopping for a drink at the stream just before our last bit of climbing. We finished our trek jumping a ditch into one of the Farm’s fields – yes, me, voluntarily jumping! He did a typically conservative jump (sensible boy) and then I dismounted and let him have a pick of grass, before untacking and brushing him down. A very relaxed, happy ride, despite his initial laziness. I think the route home suited him better, too, because it was less stoney – and I’m sure he knew it was shorter, too! Ah, I envy your sunny weather–even if it is on the chilly side! We've got snow and freezing fog here in Maine–ugh! Sounds like a wonderful ride. Isn't it amazing how horse's internal compasses always seem to work? Harley sometimes heads a little "off piste" into the woods, and often, he's got a short cut in the works! 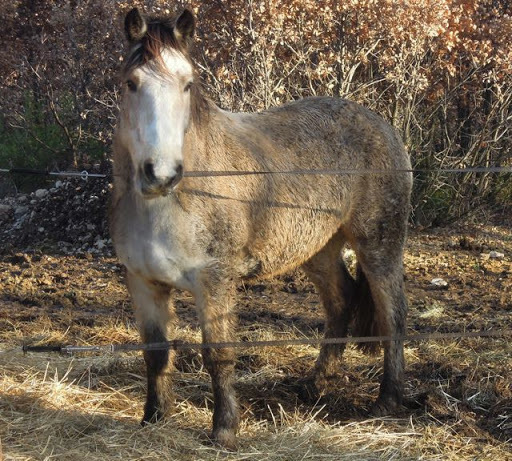 I know what you mean about the mudball horse–got one of my own right now. This one was probably about 10 or 12 km. I've wanted to ride along the crest of the ridge for some time now, so it was nice to do it.Yup, get yourself back in the saddle, you won't regret it! He's a clever boy… I was so sure he was wrong!